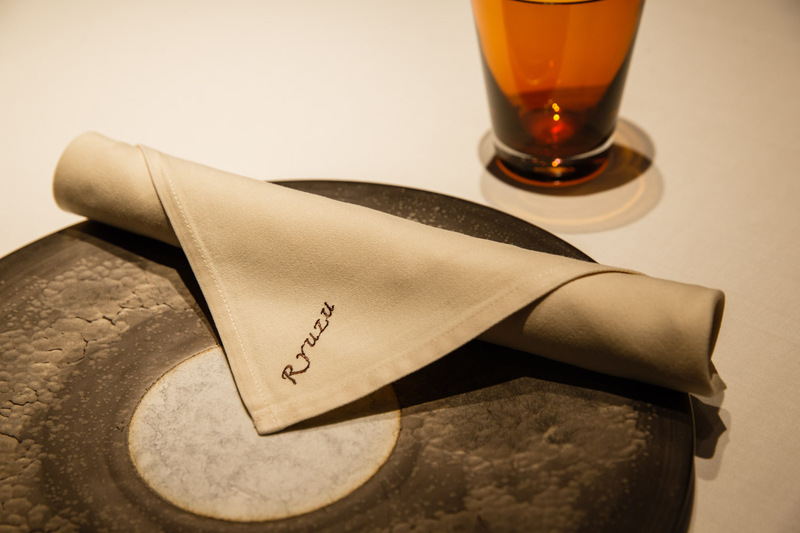 Japanese passion intertwined with French cuisine – step away from the world and suspend time at Ryuzu. 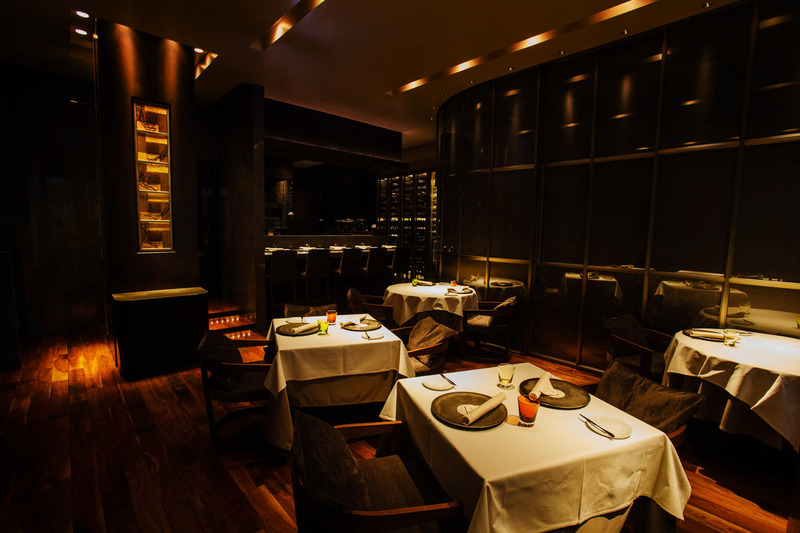 Like a warm and comforting embrace, the elegant space and exquisite cuisine at Ryuzu take you in for a moment, giving you a dining experience only possible in this time and place, created at the hands of a culinary genius with a glowing resume. A short stroll from the manicured Japanese gardens of Tokyo Midtown, you descend the stairs into a golden-glowing space where time stands still for a while. The Japanese word for the crown on a wristwatch, ‘ryuzu’ allows us to set the time. It signifies how such a small and unassuming component can have such an impact on something much larger, and suggests that we can control how time passes, by stepping away from the world and into Ryuzu. A magnificent dark timber pillar stands in the dining room, encapsulating a masterpiece by Hiroko Ueki, a Japanese glassmaker in Venice and daughter of a long-standing customer, who was commissioned to reflect the spirit of the timber. The generous use of timber throughout was inspired by Iizuka’s restored traditional Japanese family home, which features thick zelkova floorboards and a large lacquered zelkova central pillar. The beautiful juxtaposition of new materials like black stainless steel, black glass, and golden stainless steel with materials expressive of the past like marble and plush velvet, creates an interior which is at once lavishly chic and incredibly comforting. 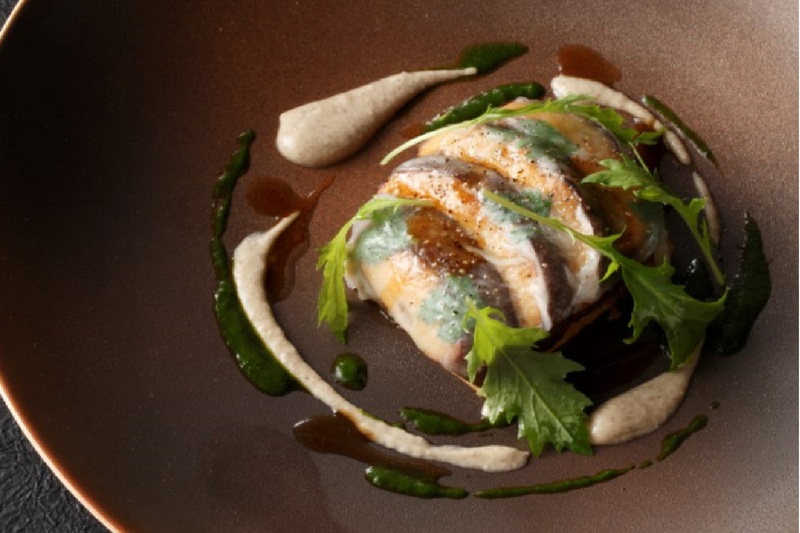 Ryuzu is French cuisine through the lens of a Japanese chef who seeks to showcase seasonal Japanese produce and display the sensibilities so close to his heart. Chef Iizuka has no desire to attempt to do French cuisine better than the French; rather, he is driven by a passion to infuse the goodness of the Japanese spirit and techniques into a foundation of French cuisine to discover the incredible results that can yield. Showcasing each ingredient’s innate flavors, Iizuka’s cuisine is light, approachable and delectable. Iizuka’s unique style is about focusing on and drawing out the very best in each ingredient and stripping it down to reveal the ultimate in simplicity and pure flavor. It sometimes means incorporating kombu, white soy sauce or other traditional Japanese elements, or adding a touch of fats and oils as in traditional French cuisine. Courses take you on a journey through the seasons with dishes inspired by Chef Iizuka’s tapestry of experiences in Japan, France and Luxembourg. Carefully composed dishes of foie gras, roasted veal or pork, fresh seasonal fish and seafood – whatever the season, the dishes at Ryuzu are certain to stimulate all your senses. 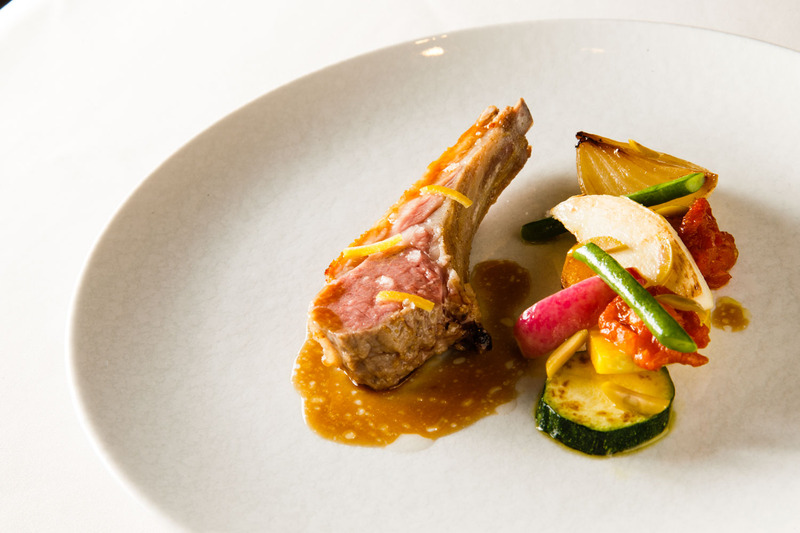 In summer, you may enjoy French-raised roasted lamb, accented with the fresh flavors of lemon and served with a selection of seasonal vegetables, vivid in color and bursting with flavor having been steamed only in their own juices. 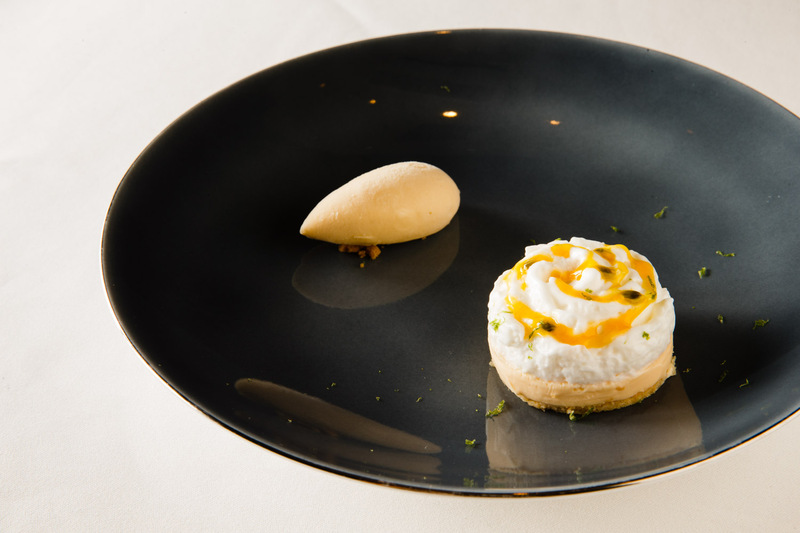 And for dessert – a delicate crispy base topped with mango cream, lime espuma and a touch of fresh passionfruit alongside a perfectly shaped verbena ice cream quenelle. 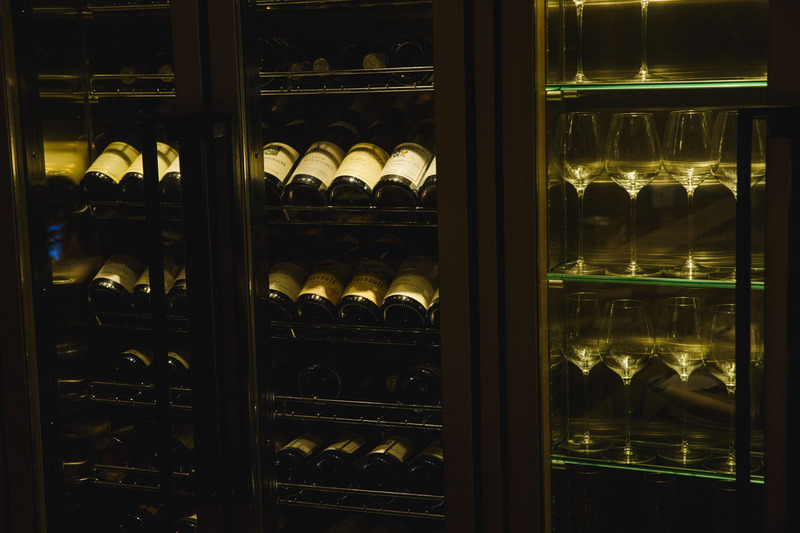 The cuisine pairs beautifully with the premium wines of Burgundy and Bordeaux, and guests can enjoy a wine degustation which changes daily through the collaboration of chef Iizuka with the sommelier. Iizuka makes regular visits to Tsukiji, but most of Ryuzu’s produce arrives direct from farms and ports around Japan. Among countless deliveries each day, abalone from Shimane Prefecture and hamo daggertooth pike conger from Tokushima may be followed by vegetables grown in nearby Yokosuka, as far as Noto Peninsula in Ishikawa, or in the abundant natural environment of Tokachi, Hokkaido. More than eighty percent of Ryuzu’s ingredients are sourced within Japan. One product he is especially proud of is the Yairo shiitake mushrooms that are grown in Uonuma, Niigata, next to the chef’s home town. Used to make one of the signature dishes, the shiitake are thick and succulent, and maintain their generous fullness even after roasting. Chef Iizuka’s leisure time is spent visiting his suppliers around the country to discuss ideas and forge new collaborations. He is always open to new ideas and relationships, especially when he sees someone giving their all to their craft, just as he does to his cuisine. Ryuta Iizuka wanted to become a chef from his elementary school days. With both parents busy in the family kimono store, he was forced to do some of the cooking, but rather than feeling burdened by the task, Iizuka was fascinated. Growing up, he loved his grandmother’s western-style creations like hamburger steaks and creamy macaroni. These were especially appealing as, due to his mother’s dietary restrictions, they never appeared at his family table. Iizuka joined Tsuji Culinary School after graduating from high school and began his hands-on training as a chef at the Hotel Okura Tokyo Bay, making everything from fried rice to curries, developing a very broad base and acquiring the fundamentals of various world cuisines. Having proved himself after working in three different hotels, in 1994, Iizuka was hired into the kitchens of Taillevent, the first foray in Japan by world-renowned chef Joël Robuchon. Yearning for a deeper understanding of French cuisine, Iizuka apprenticed at Michelin-star restaurants in France, such as Troisgros, and dined at 27 mostly Michelin-starred restaurants in just two months as he journeyed around France. He returned to Japan and eventually led the kitchen of L’Atelier de Joël Robuchon to two Michelin stars of their own. There was a moment in Iizuka’s career when he realized how essential the Japanese approach to cooking is. 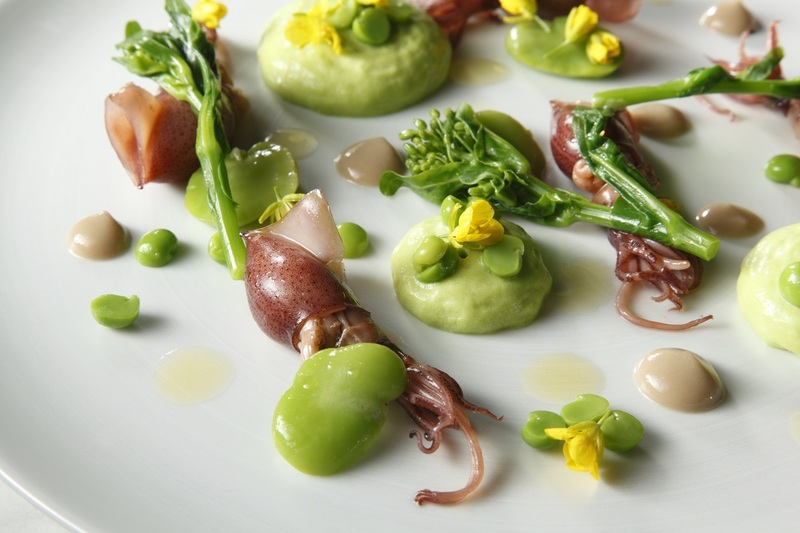 Whereas French cuisine plays close attention to the heating method, layers of flavors and elaborate sauces, the skilled knifework yielding perfectly textured squid, for example, can constitute ‘cooking’ in Japanese cuisine. He was shocked to find that flavors and textures are not only influenced by the quality of the ingredients, but that a knife has the power to further transform them. This is the moment that led him to trade some of the double-edged knives he had grown accustomed to for the single-blade Japanese-style knives, which he now believes can truly bring out the best in certain ingredients. It also sparked an interest within Iizuka to return to his Japanese roots. 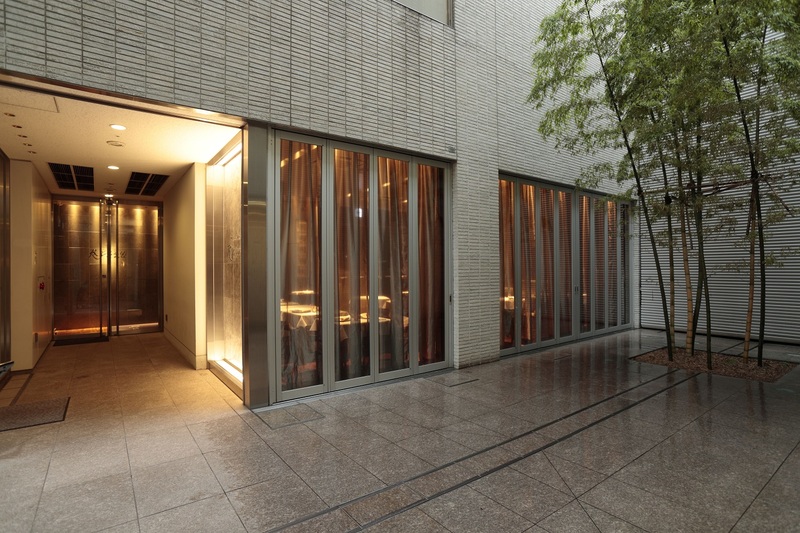 With the opening of his own restaurant Ryuzu, 2011 marked a brand new beginning for Iizuka. A former Robuchon prodigy, Iizuka feels an enormous sense of freedom now that he is on his own. Free to use whatever ingredients he chooses, Iizuka can infuse his cuisine with a stronger sense of wa – the distinctive Japanese quality that was missing before – and to exhibit more seasonality, which is so integral to traditional Japanese cuisine. Chef Iizuka believes in paying his staff fairly for their hard work and raising them into the chefs of the future. He is very much aware that more than simply being the chef, he is the head of an organization, and it needs to have a properly structured and fair working environment. He wants to see everyone happy and would be delighted if some of his chefs make a name for themselves going forward. Once seated, your eyes are drawn immediately to the exquisite platter before you. Taking more than a year to complete, these bespoke Arita-yaki platters, of which there are just 40 in the world, are made in the highly acclaimed kilns of Kamachi Toho in Takeo, Saga Prefecture. They set the stage for the stunning presentation of cuisine to follow. Iizuka’s scrupulousness for quality extends through to the silverware, all handcrafted in France by a continuous line of silversmiths. Glasses are Baccarat, and the butter dishes come from the same glassmaker in Venice who created the central pillar glass work. Down to the smallest accoutrement, Chef Iizuka makes no decision lightly and spares no expense to create the perfect space.